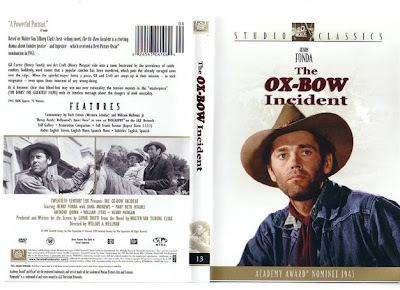 THE OX-BOW INCIDENT (1943) -Two drifters are passing through a Western town, when news comes in that a local farmer has been murdered and his cattle stolen. The townspeople, joined by the drifters, form a posse to catch the perpetrators. They find three men in possession of the cattle, and are determined to see justice done on the spot. 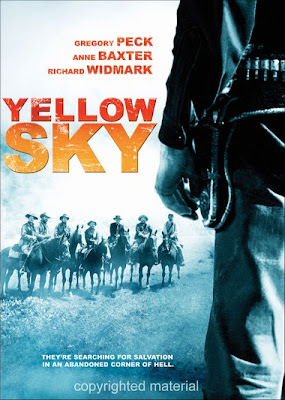 YELLOW SKY (1948) - Gregory Peck plays the leader of a band of outlaws who happen upon the seemingly deserted ghost town of Yellow Sky. As it turns out, the town does have two citizens, a prospector and his granddaughter. Figuring that the two have a stash of gold, the gang plans to rob the two, until Peck falls for the granddaughter (Anne Baxter) which pits Peck against his old gang, now led by Richard Widmark. 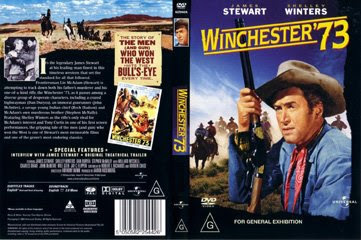 WINCHESTER ‘73 (1950) -In a marksmanship contest, Lin McAdam (James Stewart) wins a prized Winchester rifle, which is immediately stolen by the runner-up, Dutch Henry Brown (McNally.) This “story of a rifle” then follows McAdam's pursuit, and the rifle as it changes hands, until a final showdown and shoot-out on a rocky mountain precipice. 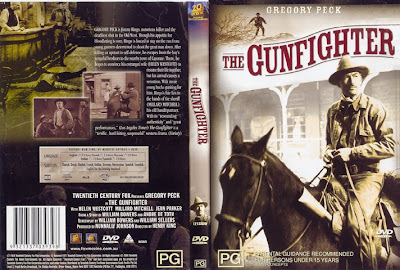 THE GUNFIGHTER (1950) -Notorious gunfighter, Jimmy Ringo (Gregory Peck) is the fastest gun in the west, but he is getting tired of it all and would like to retire. But wherever he goes, there is always some tough guys who wants to try to beat him to the draw. He rides into town to find his true love, who doesn’t want to see him. He hasn’t come looking for trouble, but trouble finds him around every corner. 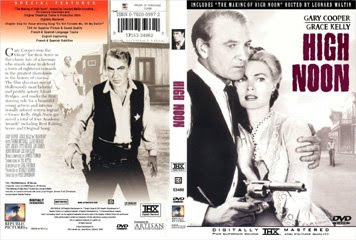 HIGH NOON (1952) -A retiring lawman (Gary Cooper) about to leave town with his new bride seeks allies among the fearful townspeople when an outlaw he put in prison returns with his gang to take revenge in this classic western. 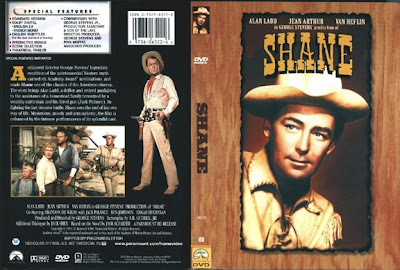 SHANE (1953) - The story brings Shane (Alan Ladd) a drifter and retired gunfighter to the assistance of a homestead family (Van Heflin) terrorized by a wealthy cattleman and his hired gun (Jack Palance). In fighting the last decisive battle Shane sees the end of his own way of life. Mysterious moody and atmospheric the film is enhanced by the intense performances of its splendid cast. THE NAKED SPUR (1953) -A bounty hunter (James Stewart) trying to bring a murderer (Robert Ryan) to justice is forced to accept the help of two less-than-trustworthy strangers. 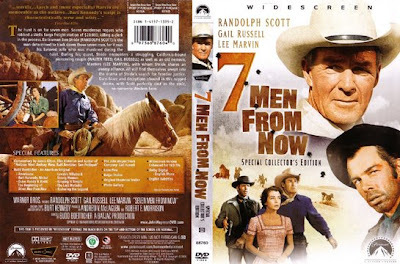 SEVEN MEN FROM NOW (1956) -A former sheriff (Randolph Scott), haunted by the loss of his wife in a Wells Fargo robbery, hunts for the seven men responsible for her death. Along the way, he assists a couple travelling west from Kansas City to California, and is forced to deal with another former outlaw he had once sent to prison. 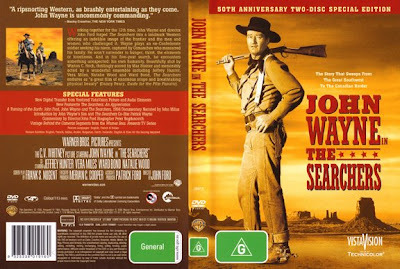 THE SEARCHERS (1956) - John Wayne plays ex-Confederate soldier Ethan Edwards a believer more in bullets than in words. He's seeking his niece captured by Comanches who massacred his family. He won't surrender to hunger thirst the elements or loneliness. And in his obsessive five-year quest Ethan encounters something he didn't expect to find: his own humanity. 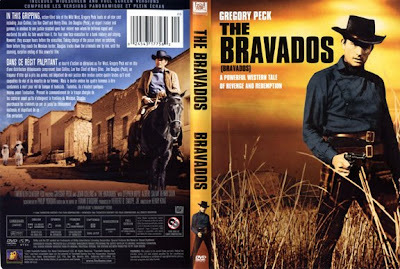 THE BRAVADOS (1958) -Jim Douglas (Gregory Peck) rides into town the night before the hanging of four outlaws. He’s been on their trail, believing they raped and killed his wife. But hours before the execution, the four escape, taking a beautiful young woman hostage. 2. The Professionals- I forgot the director but this stars, Burt Lancaster, Robert Ryan ,Lee Marvin, and Jack Palance. 3. Rio Bravo- Stars John wayne, Ricky Nelson and Dean Martin. 4.The Sergio Leone/Clint Eastwood, classic Spaghetti western trilogy. 5. Once upon a Time in the West- Sergio Leone, stars Charles bronson, Jason Robards, and Henry Fonda. 6. Duck You ,Sucker -Sergio Leone, stars Rod Steiger and James Coburn. 10. Wild Bill-Walter Hill. Wild Bill Hickok in the Dakotas. How about posting "Top 10 Akira Kurosawa movies"? The Bravados and of course Shane are definitely in my top ten. I can't believe The Bravados is also somebody's favorite. This is just one of the best westerns for me, though it is little known. The twist in the end blew me away, when Peck finally caught up with the Indian, and learned the truth. I've seen it a few times and I intend to watch it again, I've got the VHS. I first saw it on the big screen at Ever Theater in Manila when it first came out. Another western that's my favorite, and I'd list in my top ten is another Henry Fonda starrer with Richard Widmark - Warlock. Again this one is little known, with Widmark as the young sheriff, and Fonda as a fast-draw Marshall hired to keep peace in the town of Warlock. Auggie's list is good too, I'd pick some in my top ten, but darn it I haven't seen one in your list, Yellow Sky. Auggie, Shane has to be in anybody's top ten westerns. I've seen it at least 10 times probably, and always, waiting when finally Jack Palance and Shane meet head to head. You know the ending, hahaha. Another movie that I've been looking for, and I can't find, and can't remember the title, stars Don Murray (who starred with Marilyn Monroe in Bus Stop). It's the story of a cowboy who's faster with a rifle than an opponent with a handgun and holster. I saw it at Ever too, and released by 20th Century Fox. I've searched Don Murray's filmography, and it's not listed. Anybody remember the movie?